Paul Gauguin 10 years lived in French Polynesia and we can often see slightly dressed local beauties on his paintings. 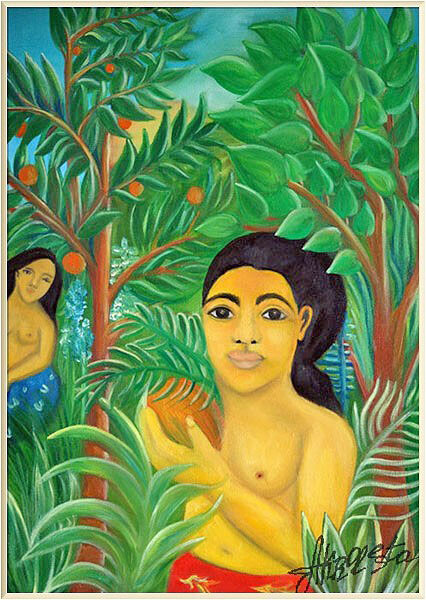 This painting shows Gauguin's girls who are walking in the tropical fairy-tale gardens of Henri Rousseau, the French primitivist artist. Gauguin and Rousseau were often criticized during their lifetime. Only after their death, art historians could understand their paintings and their contribution to the art. "Eugène Henri Paul Gauguin (7 June 1848 – 8 May 1903) was a French post-Impressionist artist. Unappreciated until after his death, Gauguin is now recognized for his experimental use of color and Synthetist style that were distinctly different from Impressionism. Towards the end of his life he spent ten years in French Polynesia, and most of his paintings from this time depict people or landscapes from that region. Gauguin was an important figure in the Symbolist movement as a painter, sculptor, printmaker, ceramist, and writer. His expression of the inherent meaning of the subjects in his paintings, under the influence of the cloisonnist style, paved the way to Primitivism and the return to the pastoral. Henri Julien Félix Rousseau (May 21, 1844 – September 2, 1910) was a French post-impressionist painter in the Naïve or Primitive manner. He started painting seriously in his early forties; by age 49, he retired from his job to work on his art full-time. Ridiculed during his lifetime by critics, he came to be recognized as a self-taught genius whose works are of high artistic quality. Rousseau's work exerted an extensive influence on several generations of avant-garde artists."